FULLERTON — The campaign for the 39th Congressional District took an ugly turn Saturday when Democratic candidate Jay Chen’s Fullerton headquarters was vandalized. 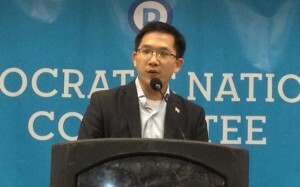 Jay Chen at the Democratic National Convention. According to Deputy Campaign Manager Tim Bell, at approximately 2:10 a.m., vandals tore down signs and placards outside of the office, and sped away in a car when staff came out to investigate. “We will not be deterred by these efforts to suppress our voice. Change is on its way to Fullerton and the rest of the 39th Congressional District, and these petty attacks only affirm our mission,” said Bell. Bell was also referring to the first negative mail attack against Chen by the Republican incumbent, Ed Royce. “I am amused that Royce has to resort to putting words in my mouth,” said Chen. It is quite sad that Ed Royce feels so desperate to attribute a fabricated lie to Jay Chen. Jay has offered many times to debate Mr Royce and he won’t do it. It is because he is not ready to and never will be. Jay is much smarter and has ideas that will better serve his district. Ed Royce’s best option is to send out mailers with lie and lay low because he’s got nothing good to say about his own campaign or success as a respresentative. I hope people in the district are learning that it is time to replace Ed Royce with Jay Chen. Ed Royce is a chicken. He refuses to debate or even be at a bipartisan event as welcome to the community as the healthcare workshop in Rowland Heights. His mailer quickly went to the bin.